Welcome to our range of solid high precision linear shafts. 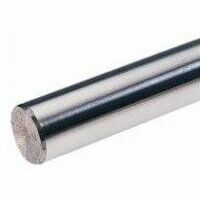 Our shafts are manufactured by INA & are all ground and hardened to 670HV + 170HV (59 HRC + 6 HRC). Please do contact us directly is you can not find your required size, as INA can cut from the max length of 2300mm to virtually any size. We can also offer Drilling, tapping, keyways, radial holes, steps, & special chamfers.